In cosmic circles, brown dwarfs are something of a flop. Too big to be considered true planets, yet not massive enough to be stars, these free-floating celestial bodies are, in fact, sometimes referred to as failed stars. But do they really form as stars do -- from collapsing clouds of gas -- or are their origins completely different? A series of publications by University of Michigan astronomer Ray Jayawardhana and collaborators, including a paper in the Jan. 16 issue of Science, offers evidence that brown dwarfs and Sun-like stars are born in much the same way. "They at least have very similar infancies, which may mean that they also have very similar origins," said Jayawardhana, assistant professor of astronomy. Brown dwarfs in a star-forming region in the constellation Chamaeleon. 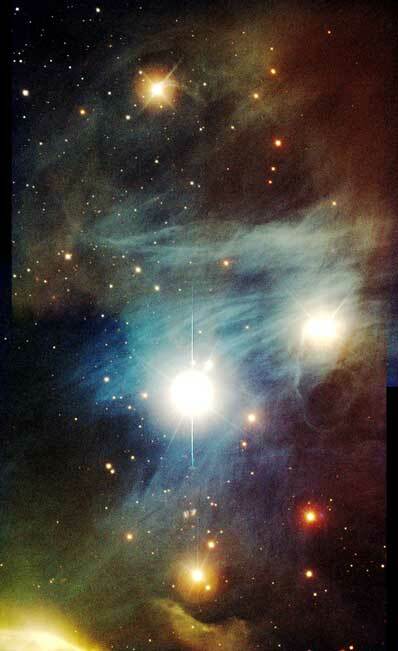 Stars form in cold clouds of gas and dust in interstellar space. Dense clumps within these clouds contract under their own gravity, spinning up in the process and gathering material from the surroundings into a disk. Eventually, if a growing protostar accumulates enough mass, its core becomes hot and dense enough for nuclear fusion to occur, and the new star begins to shine. Some scientists have suggested that brown dwarfs form the same way but simply don't accumulate enough mass to ignite hydrogen fusion, and calculations show that it's at least theoretically possible for objects with masses as low as those of brown dwarfs to be born this way. But other scientists have proposed that brown dwarfs are runts kicked out of stellar litters. In this scenario, brown dwarfs are born in multiple star systems and compete with their siblings for matter from the natal cloud. In such systems, the slowest-growing object may be ejected before it gathers enough material to become a star, computer simulations suggest. One way to distinguish between the two possibilities is by studying disks of dust and gas around young brown dwarfs. If brown dwarfs form as stars do, they should have large, long-lived accretion disks like those found around young stars. But if they have been ejected from multiple star systems, their disks should be shaved down by the gravitational interactions that lead to ejection. Jayawardhana and colleagues searched for dusty disks around young brown dwarfs by observing their infrared emission with the 8-meter Very Large Telescope (VLT) of the European Southern Observatory in Chile and the 10-meter Keck I telescope in Hawaii. Because dust particles in a disk absorb light and re-radiate the energy at infrared wavelengths, a brown dwarf with a disk will emit more infrared light than one without a disk. "We found that the majority of brown dwarfs are surrounded by dusty disks at an age of a million years or so," said Jayawardhana. "That's similar to young stars at the same age." Although it's not possible to directly determine the disks' sizes, their presence around some brown dwarfs as old as 10 million years suggests that they aren't pared away in early life. Other spectroscopic observations, using the twin 6.5-meter Magellan telescopes in Chile (in which the University of Michigan is a partner institution) and the Keck I telescope, showed that brown dwarfs also accrete material from surrounding disks the same way as stars do -- although at a slower pace. "We detect telltale signs of gas flowing from the inner edge of the disk onto the brown dwarf at velocities of over a hundred kilometers per second," said Jayawardhana. In one intriguing case, astronomers have also found evidence of material spewing out from the poles of a brown dwarf. Such jets have been seen in young stars of the same age, but not until now in brown dwarfs. "If confirmed, the presence of jets would further strengthen the case for remarkably similar infancies for brown dwarfs and Sun-like stars," said Jayawardhana, whose collaborators include Subhanjoy Mohanty (Harvard-Smithsonian Center for Astrophysics), Gibor Basri (University of California, Berkeley), David Barrado y Navascues (Laboratory of Space Astrophysics and Fundamental Physics in Madrid, Spain), David Ardila (Johns Hopkins University), Beate Stelzer (Astronomical Observatory of Palermo in Italy), and Karl Haisch, Jr. and Diane Paulson (both at the University of Michigan). "I wouldn't say that the story is signed, sealed and delivered," Jayawardhana said, "but the preponderance of evidence is very much leaning in the direction of these things forming the same way as stars." And the evidence uncovered so far leads to even more tantalizing prospects. "Now that we know many young brown dwarfs are surrounded by disks," he said, "I can't help but wonder if comets and asteroids -- if not small planets -- could form in these disks."